Some of the more eagle-eyed amongst you may have noticed that even by Cheese and Biscuits' own pretty poor standards, the quality of the food photography has gone a bit downhill in the last couple of reviews. There's a reason for this - I was one of the lucky few people to receive a brand-new Apple iPhone 3G on 17th July and like the besotted gadget-geek I am I have been inseparable from it ever since. Please rest assured that once the fog of new love has lifted I'll get round to carrying round a proper camera with me; I won't promise however that any camera in the world can make the food at somewhere like Grumbles look good. Anyway I don't care if the iPhone does have a slightly dodgy camera and the keyboard takes a bit of getting used to - it's the most stunning bit of technology I've had the pleasure of using in many, many years and I can't recommend it highly enough. And while we're on the subject of iPhones, I'd like to put a word in for a fantastic little app I found on iTunes yesterday called Urbanspoon. It works like a kind of restaurant fruit machine, using your location, a style of cuisine and a price range to suggest places you might like within short travelling distance. If you aren't that taken with what it comes up with you literally shake your iPhone from side to side, the barrels start spinning and you receive another suggestion in seconds. Once you're happy, tap on the restaurant name and Google Maps provides a route and an estimated journey time. All very clever. So far I've tried it at work in Shoreditch and at home in Battersea and the places it's suggested have been pretty much on the mark. Right now the only area of the UK it has a decent knowledge of is London, but I'm told this will change very soon. My second find isn't an application but the iPhone-enhanced Food Network Recipe Search. As any new iPhone owner soon realises, there's hardly any need to have special mobile versions of websites any more as the mobile Safari does such a brilliant job of rendering normal sites. But a nice compact search page saves zooming in and out when you have one hand on the grill pan, and with 30,000 recipes to search through you're bound to find something attractive. I realise some of the recipes are quite US-centric, but given that half those listed on BBC Food have been incorrectly and incompletely copied down from an episode of Ready Steady Cook (one Anthony Worrall-Thompson concoction I tried a few months ago involved peeling and dicing a number of vegetables that never found their way into the final dish), that's a small price to pay. 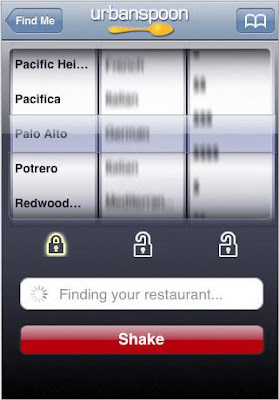 If anyone has found any other foodie iPhone applications or websites they can't live without, I'd be very interested in hearing about them. Super Monkey Ball doesn't count, by the way; I don't care if it does involve eating huge amounts of bananas. I blame myself. I should have known that drawing attention to my recent run of what I will call, for want of a better word, "luck" with budget restaurants that I was only setting myself up for a fall. But then complacency is never a good thing, and having an unpleasant dose of reality does occasionally help give you a sense of perspective. In other words, it will be a lot easier to count my blessings at the end of the next bad meal knowing that, all said and done, at least I'm not eating at Grumbles. Things started going downhill almost the moment we were set down, antisocially close to diners on either side of our pokey table. 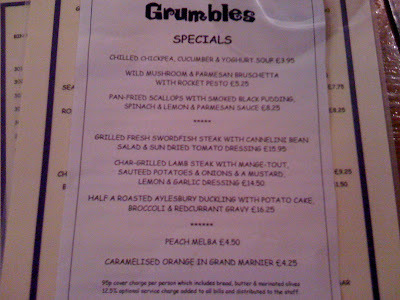 Finding nothing of particular interest on the laminated main menu, I found myself browsing the specials, which listed items such as Aylesbury duckling and swordfish steak, but at prices more suited to grander surroundings - £16.25 for example, for the duck. Thinking they must have something to brag about in charging that price, I threw caution to the wind and ordered it. 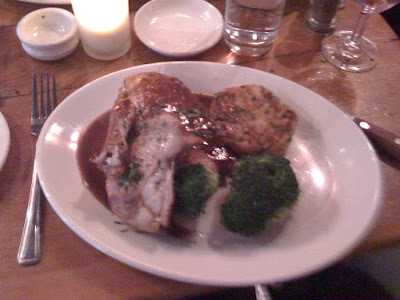 What arrived was a sad lump of boiled broccoli, a huge anaemic slab of duck, cooked through to fatty grey oblivion, and a little stack of salty fried potato cake. It wasn't anywhere near as good as the duck and orange dish I was served at the Spaghetti House in Tufnell Park back in March, and cost more than twice the price. There was no excuse for it. Having skipped starters with the intention of trying desserts for a change, I was therefore left with a decision to make. 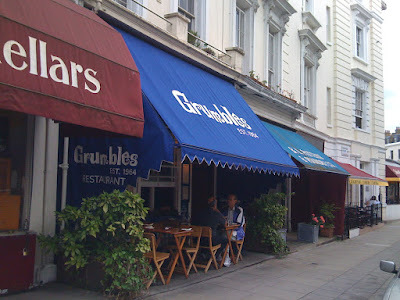 Should I give Grumbles the benefit of the doubt and soldier gamely on, or cut my losses and have dessert at home? I let my gaze wander to the open kitchen, where a grubby-looking chef was slumped next to a microwave, head in his arms as some unfortunate diner's meal rotated quietly beside him. The 'ping' as the timer ran out roused him just enough to shovel it onto a plate and to the pass, then he went gratefully back to sleep. It would all look like a scene from Ramsay's Kitchen Nightmares were it not for the fact that the place was so inexplicably popular - they were turning people away by the time we were halfway through our dinners. Maybe it is after all possible to build a viable restaurant business by relying solely upon tourists and idiots. I necked the rest of my house red and waved for the bill. 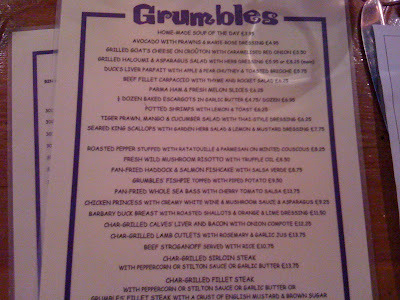 It's not that Grumbles is the worst meal I've ever had, or even had this year. No, that accolade is held by Boyago and I don't see it being toppled any time soon. But by serving such a mediocre meal, charging near top-end restaurant prices and having the nerve to slap on a £1 cover charge (as if I needed any more reasons to hate the place), it is doing just about everything wrong. And there my unhappy story would have ended, were it not for the lovely people at Gü chocolate puddings, who were nice enough to send me some of their latest range to try. And so back in the comfort of my own living room I tucked into a creamy chocolate trifle, which, being delicious, comforting and inexpensive (well, free), was exactly the opposite of my meal at Grumbles. There's something refreshing about a convenience product that makes no pretentions towards health fads - this is comfort eating, shamelessly decadent and all the better for it. And before anyone starts thinking that Cheese and Biscuits have sold out and the age of the independent blogger is dead, I didn't think much of their melty chocolate puddings that you heat up in the oven. And anyway, you just wait until somebody offers you free chocolate and see how you react. I'm only human, after all. This message is brought to you by Gü chocolate puddings. Other chocolate puddings are available. Cheese and Biscuits is an equal-opportunities chocolate pudding reviewer. All donations gratefully accepted. 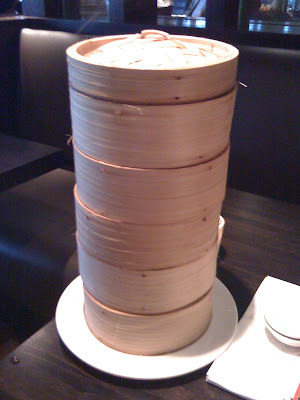 You can see why people are talking about dim sum as the "new fast food". It's tasty, cheapish (as long as you're careful) and comes with a dose of far-eastern medicinal mysticism that is as exciting to Londoners in 2008 as burgers and French Fries must have been to a nation used to Spam and Bovril in the 60's. And like the "old" fast food, we are starting to see embryonic chains of dim sum restaurants open up, as I imagine it's quite easy to standardise the dining experience of steamed dumplings and sake. 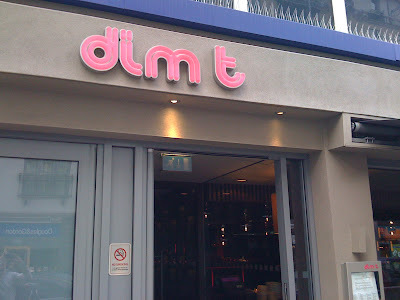 There is Ping Pong, with branches across the city and serving some excellent cocktails, and there is Dim T, comparably represented in London and with a few in carefully-selected middle-class enclaves elsewhere (Maidstone, Tunbridge Wells, you know the kind of places). As I've said before on many occasions, I don't have any problems with chain restaurants at all as long as they're good. 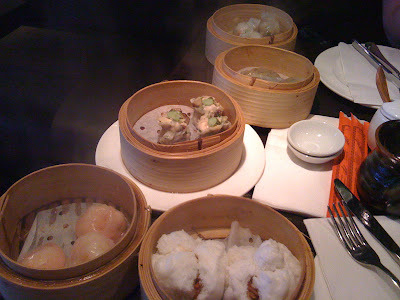 And Dim T stands up incredibly well considering some stellar competition in the dim sum field (Yauatcha, China Tang). 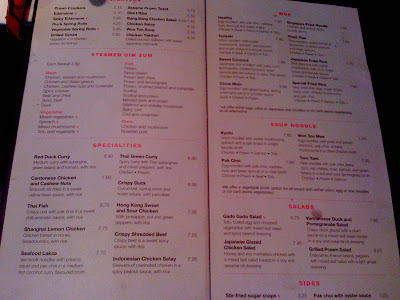 The menu is refreshingly brief for a chain Asian restaurant, nothing too unusual but enough to keep most people happy, and indeed this is somewhere that knows its customers well, with "Healthy" salads and soups on offer amongst the fried rice and crispy duck. The only problem I had was that it occasionally seemed a bit too dumbed-down, with "Buns" instead of "Char Sui", but then this is a minor and pretty pedantic (even by my standards) complaint. I was initially concerned when I asked for the duck dumplings that they were off, even though every other item containing duck on the menu was available. This suggests the dumplings had been made quite well in advance, but then maybe this is normal. Certainly it didn't seem to affect the standard of what did eventually arrive, as everything was at least good, sometimes excellent. My favourites were, after all, the Char Sui, big and fluffy and with nice spicy pig meat. The scallop and prawn dumplings were a strange lurid pink colour but tasted great, and also worth a mention were the spicy chicken parcels which went very well with the chilli sauce left on the table. The only thing you could pick fault with was that some of the dumplings seemed excessively 'sticky', suggesting perhaps slight overcooking, but who cares if you have to prize them out of the baskets with your fingers when they taste so good. Add in the usual perfect service and the fact that this feast for two (including a portion of fried rice and edamame to start and a couple of alcoholic drinks) came to just over £16 each, including the 12.5%, and you have yourselves a quite wonderful evening out. The décor also deserves a special mention, all dark wood and spot lighting that wouldn't be out of place in a restaurant charging three times the price. Better toilets than Yauatcha, too. So, another day, another 8/10. We're on a roll here at Cheese and Biscuits. Long may it continue. 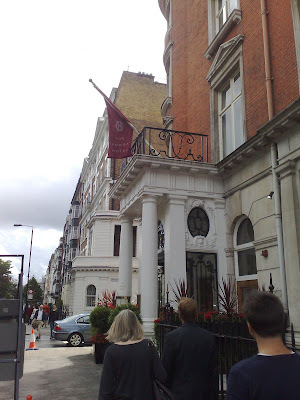 I've been to Langtry's, the restaurant at the Cadogan, a couple of times, and have had a pretty good experience each time. I'm not quite sure why I haven't written about it yet; probably because I want it to remain my little secret and not have it spoiled by the world. But also - and here's my inherent British pessimism showing - it could be that I'm waiting for them to mess up one day, and I will finally understand why the place is always empty and be able to give it the inevitable low score. Until then, I'm withholding my final appraisal. But this isn't a review of Langtry's, the Cadogan's fine dining restaurant (£22.50 for 3 courses at lunchtime - try the prawn cocktail). 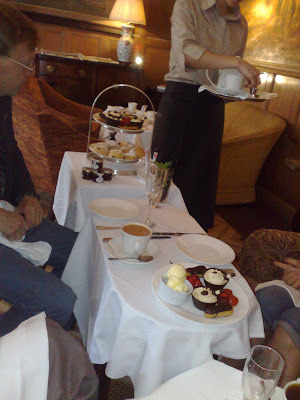 This is Afternoon Tea, which you take in the Drawing Room, a pleasant wood-panelled space served by smart waiters in dark suits, some of whom look old enough to have served Lily Langtry herself. There's a lot of history at the Cadogan, not much of it immediately obvious until you do a bit of research. Oscar Wilde, for example, was arrested in his room here in 1895 (room 118, apparently - we were tempted to try and put down this number on the bill when it arrived, but thought better of it. I do want to go back, after all), and Lily Langtry, 19th century beauty and mistress to Edward VII, continued to live here for many years after her house was adopted to become part of the hotel. How nice it must be to have your house converted into a hotel around you and to be able to carry on living in your own bedroom, only with room service. I can't think of a better way of enjoying my twilight years. 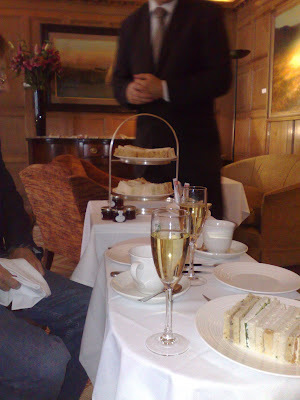 The food itself is pretty much a secondary consideration to the pomp and furnishings, as with any afternoon tea. Sandwiches were nice enough, with fresh ingredients and crusts cut off. The complimentary champagne was Perrier Jouet, and one of our party, being t-total, had a non-alcoholic cocktail made up for no extra cost (it had mint and elderflower in it and was lovely). Scones were the highlight - warm and fluffy with a huge dollop of clotted cream, although the jam was bought-in and not up to the standard of Brown's homemade offering. Finally, pastries were pretty good, with mini-éclairs, strawberry tarts and coffee cups making up what turned out to be quite a generous amount of food. It all added up to a very enjoyable afternoon. The Cadogan is unmistakeably a five-star hotel, but is unstuffy and relaxed in a way that, say, Claridge's or the Dorchester aren't. Staff are chatty and accommodating without being overly "matey", and it feels very comfortable and homely, like you're kicking back of an afternoon in your rich auntie's front room. This atmosphere was even further enhanced by the fact that we were one of perhaps only 4 or 5 tables taken, and as I mentioned earlier on previous visits to the restaurant next door we have found the place similarly and pleasingly tranquil. So I will not hesitate to recommend the Cadogan, with one proviso - that you promise not to tell too many of your friends. Deal? I'm sure there are many people who will disagree with me, but I've never considered a good burger to a particularly difficult thing to get right. As long as the lettuce isn't brown and the bread isn't stale, I'm generally happy with anything from a Burger King whopper to a hand-chopped ostrich fillet steak burger, as by the time you've smothered the thing in ketchup and pickles the quality of the actual meat isn't crucial. Which is often just as well. It therefore follows from this shaky proposition that I've had at least a decent, if not excellent, burger and chips in many an otherwise crappy pub or kebab shop up and down the country, and it is always my first choice on any menu when my faith in the standard of the other dishes is less than great. An omelette is another good "safe" bet - at the very least you'd hope they'd use fresh eggs. But while the vast majority of chain pubs and kebab shops can make me a burger I would happily eat, it's only at the other end of the scale where I start having problems. The only times I've ever had a disappointing burger is when I've been paying through the nose for ludicrous "luxury" versions that do nothing more than waste premium ingredients and give you heartburn. The Boxwood Café's veal and foie gras burger costs a whacking £25 and is so stuffed with wobbly pink liver it's like eating a fist-sized lump of butter in between two slices of toasted bread. It's telling that when Heston Blumenthal attempted The Perfect Burger as part of his In Search Of Perfection series, the end product looked suspiciously like, well, a normal minced-meat beef burger. You can't fix something that wasn't really broken to begin with, at least not without spending weeks on end micro-measuring the width of your tomato slices or aligning your meat fibres with ley lines. 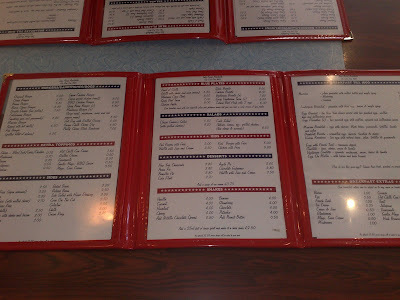 So given the ability of nearly anywhere to make a decent burger, it's probably no surprise that The Diner, in Shoreditch, being a trendily authentic recreation of a Golden-Era American diner, served me a very decent burger indeed. Golden brown toasted bread buns, crispy lettuce, a generous slice of sweet pickle, a coating of lovely bubbly melted cheese (Monterey Jack, ubiquitous in 'authentic' US diners) and of course a perfectly good slab of juicy minced beef. 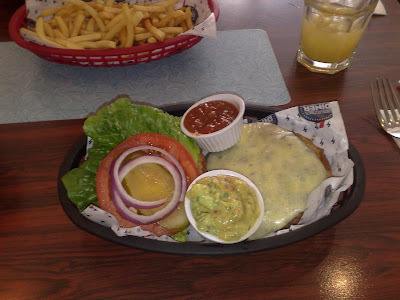 I liked the home made guacamole (nice and garlicky), the range of condiments on each table, and I also liked the way the burger was served open and you slapped the two halves together yourself before chowing it down - very satisfying. 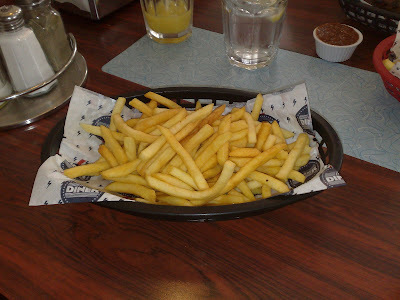 They also scored extra points for the skinny fries, which were as tasty as they were numerous. 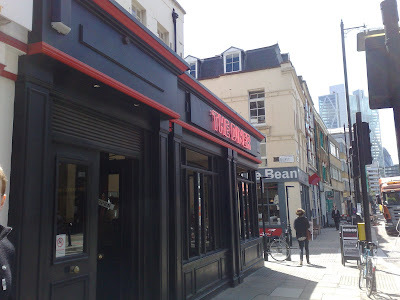 The Diner is serving food which is honest and straightforward, not too expensive and brought to you with the standard excellent London service. It's nothing to get ecstatic about, but then again there's literally nothing not to like either. On the one hand, it's yet another place to get a decent burger for a reasonable amount of money. On the other hand, what's wrong with that?